- Ideally used for heating sensitive solvent solute combinations. - Also used for extractions of key components like odor, fragrance, oil, drugs, natural extracts can be done using these flasks. From our exceptional gamut of products, we are occupied in delivering a well-designed collection of Tissue Culture Flask. Fabricated making utilization of best in grade factory material along with modern tackles and techniques, these products are in tandem with the industry defined norms and guidelines of excellence. Type: Rectangular cell culture flask canted neck, vent cap, TC - Treated. 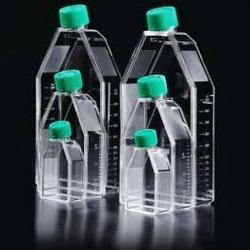 Cell and Tissue Culture Flasks are perfect for cell growth and cell yields aim on little and medium input volume. Strict integrity tested. Sterilized by gamma irradiation, non-pyrogenic. - Available in surface treated or untreated.